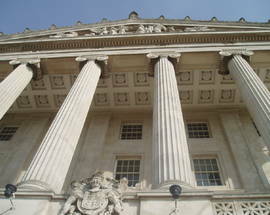 This imposing, purpose-built structure is inextricably linked with the political history of NI. 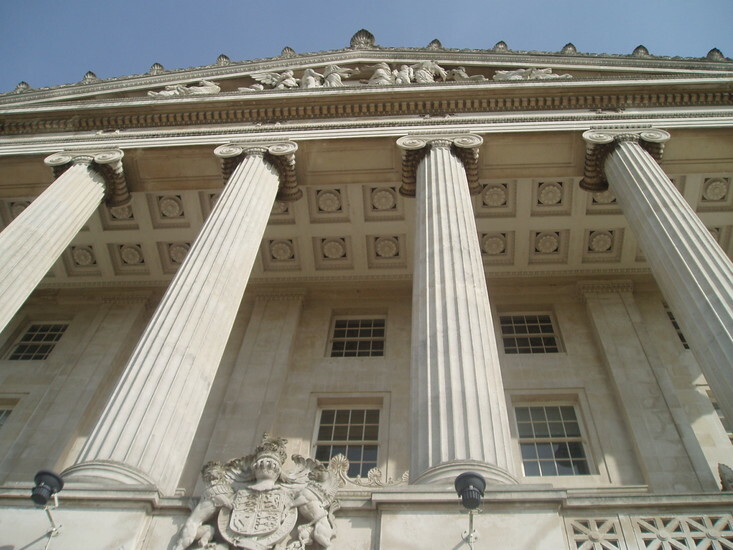 Made of Portland stone mounted on Mourne granite, Stormont was built on land acquired in 1921 for NI's new seat of Parliament, and opened by Edward, Prince of Wales in 1932. 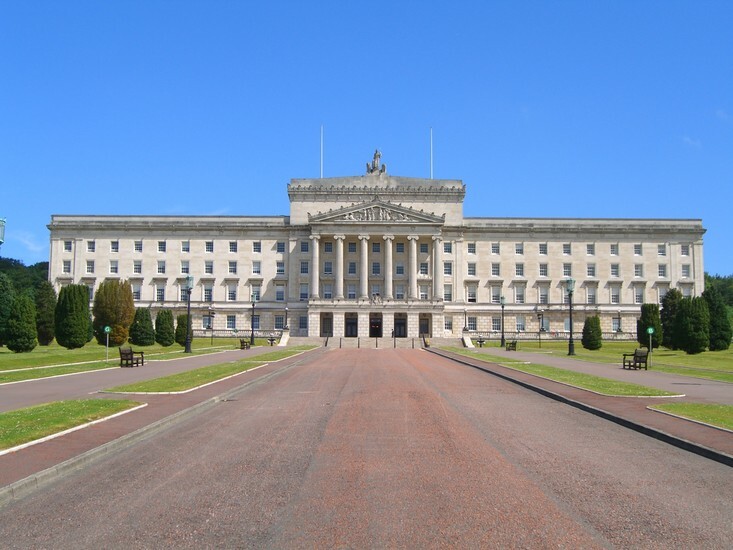 Now home to the NI Assembly (currently not sitting), the building remains a potent symbol of the precarious political process. 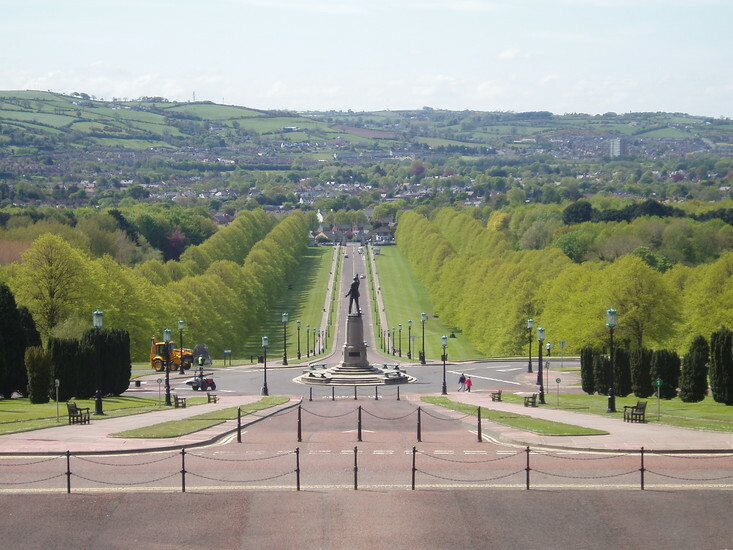 It stands at the top of the mile-long Prince of Wales Avenue behind a statue of Lord Edward Carson (Unionist MP regarded as the founding father of the NI State) and is topped by the figure Britannia. 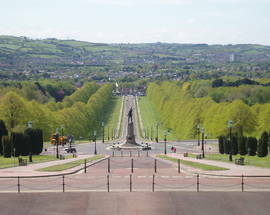 The tomb of NI's first Prime Minister Lord Craigavon and his wife is on the building's east side. The surrounding parkland with its sweeping city views is open to the public and has marked paths and an excellent children's playground. 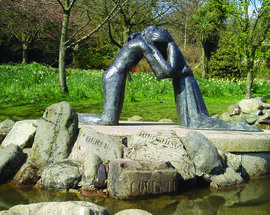 Several sculptures include Reconciliation, a small water sculpture depicting a couple embracing across a divide. 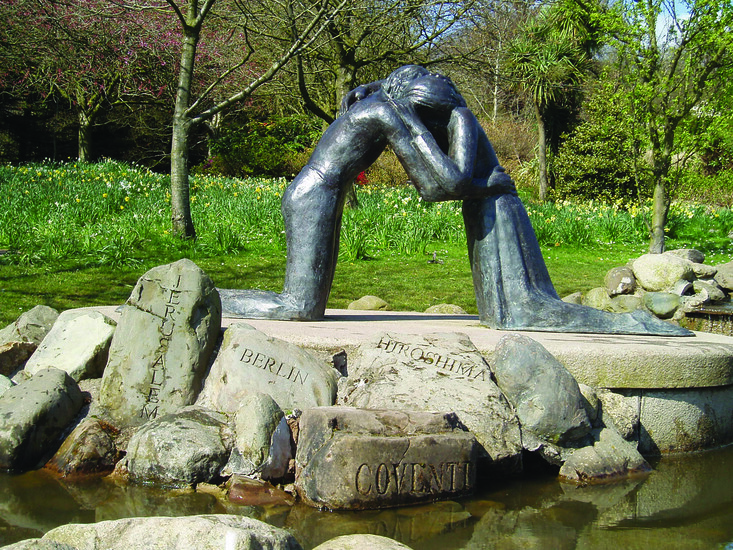 Copies of this symbol of peace are also in Coventry, Hiroshima, Jerusalem and Berlin. Enjoy unrivalled views overlooking the balcony and mile-long symmetrical sweep of Prince of Wales Avenue as you dine in this unique setting. Both Lunches and Afternoon Teas are available Mon-Fri and booking is advisable by tel. (+44) (0)28 9052 1041. 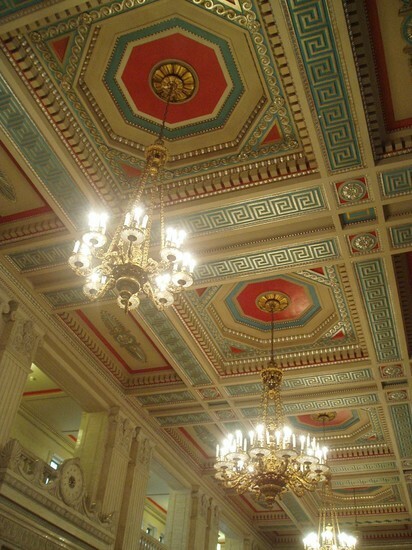 Free weekday guided tours take in the magnificent interior of this iconic building. 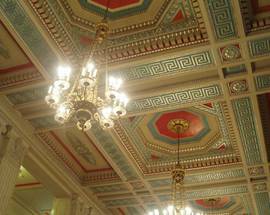 The tour begins at the main entrance and covers the Great Hall, Assembly and Senate Chambers. 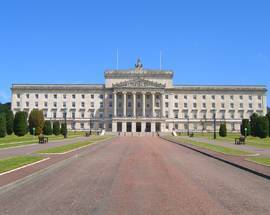 And on Mon from 12:00 and Tues from 10:30, part-time politicos among you can take a seat in the public gallery and watch MLAs in action - though not at the moment as the Assembly is currently suspended due to a political impasse between NI's two major parties, the DUP and Sinn Fein. 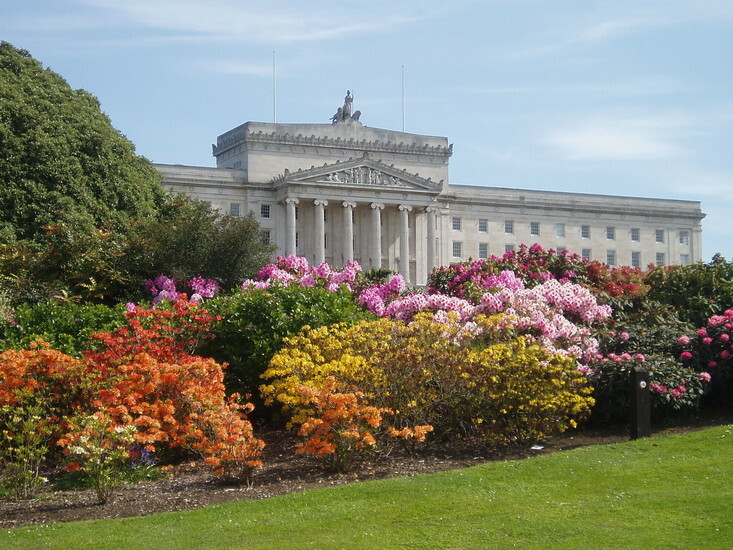 A walk around the estate completes your Stormont experience. Keep an eye on their website for amendments to tour information throughout the year. Free hourly tours Mon-Fri July, August, Easter and Halloween 11:00 - 15:00. Rest of year 11:00 & 14:00 only. 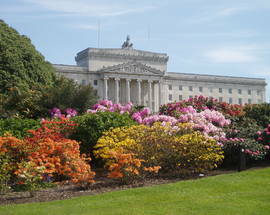 Private tours of Parliament Buildings can be arranged outside these hours through your local MLA. Great Hall, coffee and gift shop open Mon-Fri 09:00 - 16:00. Anyone requiring assistance due to hearing or sight impairments can request a sign language interpreter, braille tour script or for the provision of 'Hearing Helpers' in advance from the Events Office tel. 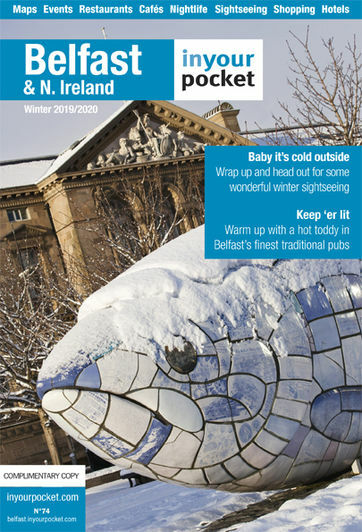 (+44) (0)28 9052 1802 or events@parliamentbuildings.org​. The postcode is BT4 3XX - ed.